Austin Kayak published a great article called 5 Tips to Extend Your Paddling in Cold Weather. 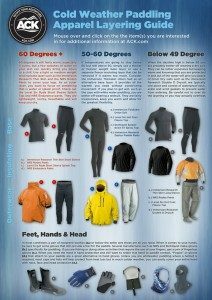 Cold Weather Layering Guide. Image from Austin Kayak. This entry was posted in Cold Weather Paddling, Safety. Bookmark the permalink.